Retired A/XEN B&R from MES having 3 years diploma of Associate Engineer in Civil Technology. Minimum 20 years in the field of construction in MES. Retired AE B&R from MES having 3 years diploma of Associate Engineer in Civil Technology. B.Sc (Engineering) Mechanical (1st division) from HEC recognized university (No second division in the entire academic record). M.Sc (Engineering) (1st division) from HEC recognized university (No second division in the entire academic record). Comprehensive knowledge of operation and maintenance of HVAC system equipment. Firefighting pumps, protection, and sprinkler system. 3 years Diploma of Associate Engineer in Mechanical Technology (1st division) from recognized Polytechnic Institute (No 2nd division in the entire career). 10 years in relevant field. Retired Soldier up to Naik having relevant trade with exemplary character can also apply. Matric with Science minimum second division with at least 50% marks. 6 years in relevant field. Applications should reach the Director Administration and Logistics PO box No 368 GPO Rawalpindi. 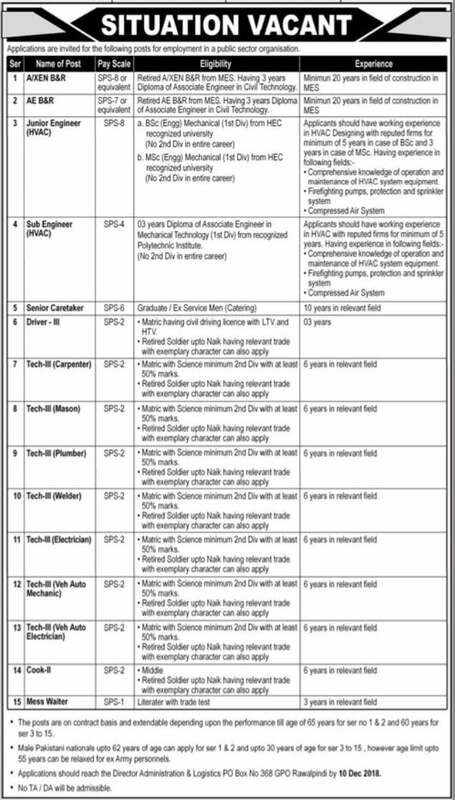 Last Date to Apply for PO Box No 368 Rawalpindi CWO Jobs 2018 10-December-2018.